If you have never gotten on the probiotic (healthy bacteria for your gut) bandwagon because you didn’t like yogurt or if you have never been a beer drinker because you thought it too unhealthy, brace yourself. Ayla Bystrom-Williams, a 29-year-old home brewer, may be about to make our worlds collide with a healthy probiotic hybrid beer. And this isn’t just some pie in the sky dream of hers. She’s found some heavy-duty brewing lab partners at Los Alamos (yes, where they developed the atomic bomb) and an alcohol survivable form of probiotic. One of my favorite health related truisms via the movie Princess Bride “If you haven’t got your health, you haven’t got anything!” seems to be in need of an update. Ongoing research in multiple fields indicates the well quoted line should really be “If you haven’t got a healthy gut, you haven’t got anything.” A growing body of evidence is uncovering links (there is a whole “gut-brain axis“) between gut health and brain disease, mood and neurological disorders. By studying gut bacteria and brain activity, neurologists have found one underlying similarity to disorders like Alzheimer’s, Parkinson’s, autism, multiple sclerosis, etc. That similarity is inflammation. Anyone else seeing an annual gut check in our futures? When it comes to food, the sides of good and evil would seem pretty clear. Nutrients are good guys. Toxins are evil — except when they are not. Researchers are finding that it is not only micro nutrients, but natural toxins found in fruits and vegetables actually play a significant role in our bodies ability to stay health and fight against unhealthy exposures. “…one common theme of exercise, fasting, and at least a few of the specific chemicals [toxins] in fruits and vegetables that we looked at, is they increase production of proteins that are called neurotrophic factors. And it’s been known for a long time that these neurotrophic factors are critical for learning and memory and for the survival of neurons. Don’t expect to see healthy toxins listed on the FDA nutrition guidelines anytime soon. They are still struggling to explain good fats vs bad. Hey, if our gut bacteria are able to control our body and mind, then the whole “Who’s got a bigger population” is moot. 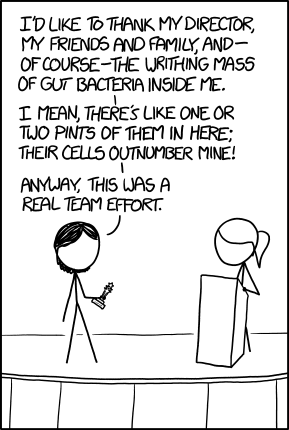 I say we teaming up with our gut microbiome and start practicing our gut concession/acceptance speeches now! Okay, your turn. Heard any interesting gut health news lately? Seen any ponder worthy posts or news in general that may have been missed by the eagle eyes of most media outlets? Share your thoughts and/or your news in comments! Haha – apparently there is a new carrot beer in Australia! Wow. Carrots would not be my first pick for a beer/veggie combo. I can’t imagine the taste. Have you tried it?